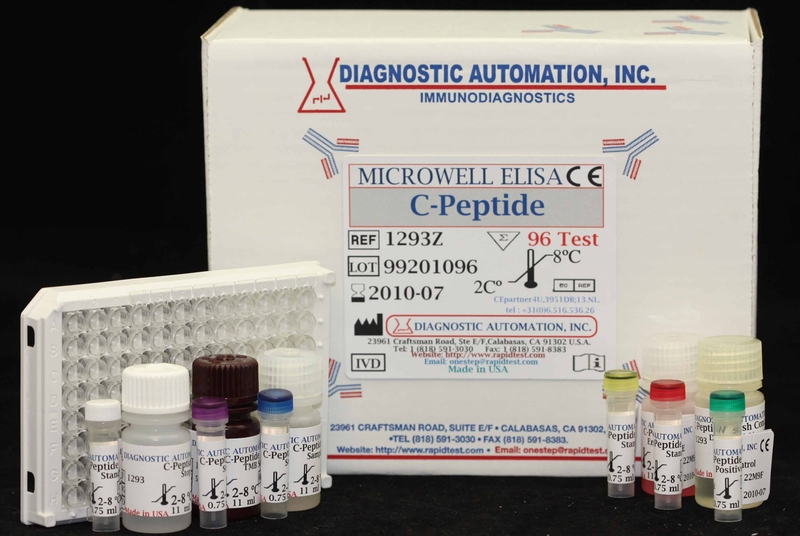 The DAI Leptin Enzyme Immunoassay Kit is used for the quantitative determination of Leptin in human serum and plasma. Leptin is from the Greek word Leptos which means thin. This hormone is made by fat cells and regulates the amount of fat stored in the body. Leptin exerts this effect by adjusting both the sensation of hunger and of energy expeditures. Hunger is inhibited when the amount of fat stored reaches a certain level. Leptin is then secreted and circulates through the body, eventually activating leptin receptors in the hypothalamus. Energy expenditure is increased both by the signal to the brain, and directly via leptin receptors on peripheral targets. Although leptin reduces appetite as a circulating signal, obese individuals generally exhibit a higher circulating concentration of leptin than normal weight individuals due to their higher percentage body fats. These people show resistance to leptin, similar to resistance to insulin in type 2 diabetes. Leptin, also plays a role in other physiological processes, as evidenced by its multiple sites of synthesis other than fat cells, and the multiple cell types beside hypothalamic cells which have leptin receptors. Many of these additional functions are yet to be defined. 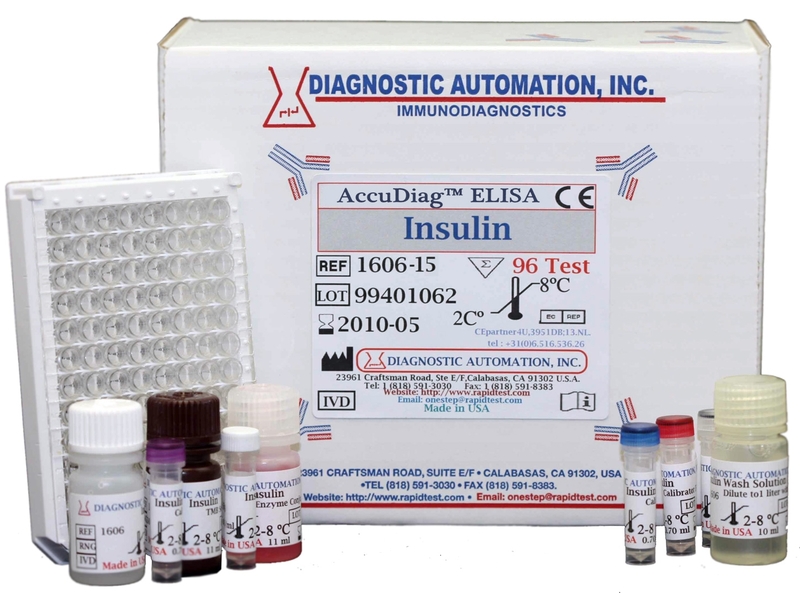 The Diagnostic Automation Leptin ELISA Kit is a solid phase enzyme-linked immunosorbent assay (ELISA) based on the sandwich principle. The microtiter wells are coated with a monoclonal antibody directed towards a unique antigenic site on a Leptin molecule. An aliquot of patient sample containing endogenous Leptin is incubated in the coated well with a specific rabbit anti Leptin antibody. A sandwich complex is formed.After incubation the unbound material is washed off and an anti rabbit peroxidase conjugate is added for detection of the bound Leptin. Having added the substrate solution, the intensity of color developed is proportional to the concentration of Leptin in the patient sample. 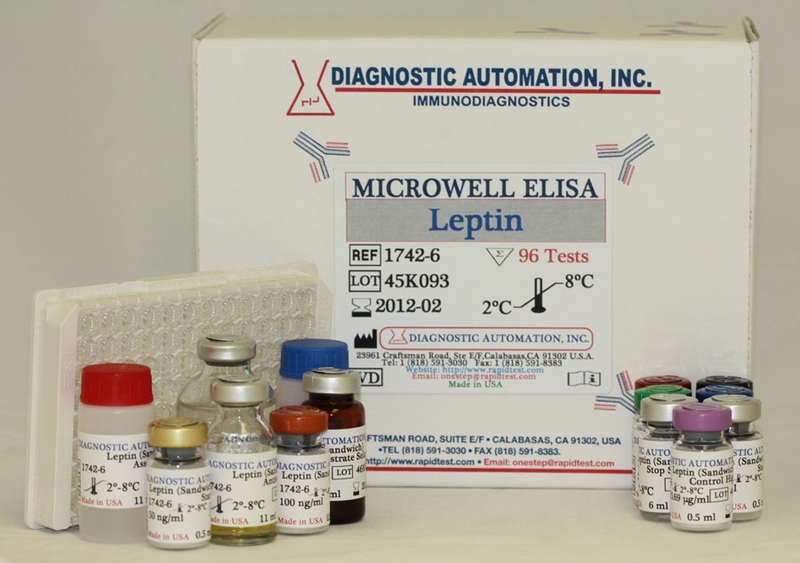 Serum or plasma can be used in this Leptin ELISA Test kit. Do not use haemolytic, icteric or lipaemic specimens. Please note: Samples containing sodium azide should not be used in the assay.